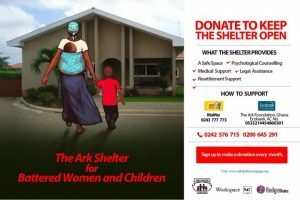 The Ark Foundation in collaboration with Hedge Ghana, successfully launched a campaign to revive its shelter on Friday 07/09/2018. The Ark Shelter forms part of the Crisis Response Centre (CRC) project which was established by the Ark Foundation in August 1999 to respond to cases of abuse against women and children. It provides a safe space for women and children who suffer from domestic violence and abuse. The Ark Shelter ensures that victims are well taken care of (i.e. fed three times in a day), they are also given the opportunity to speak out and share their experiences for onward assistance. It has however been closed down due to inadequate funds to keep it running. The purpose of the campaign is to raise $75000 to re- open the shelter. This will help to acquire a vehicle, refurbish the facility, acquire the services of social workers, medical practitioners, psychologists, legal services and also cater for the upkeep of the victims. We love you for donating.